Lockside Antiques, run by Evelyn Booth, specialises in selling interesting items with a narrowboating theme. 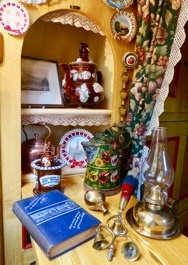 These include antique ribbon and lace plates and original Measham pottery as well as interesting brass items, oil lamps, cabin lace by the metre and rag rug kits. These are all popular with boaters who want to decorate the traditional back cabins of their narrowboats with authentic pieces but they are equally sought after by people who want to start a collection or decorate their homes. As well as selling boating antiques, Evelyn has appeared as an expert on Flog it! when it visited the IWA Festival at Beale Park in 2003 and has appeared in The Waterboatman series in 2010, discussing boating antiques. In 2016, she was interviewed on Hope FM about boating antiques. 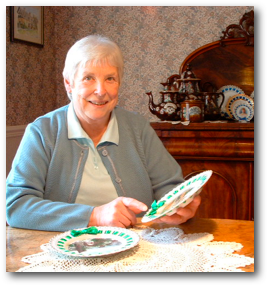 She has also had articles on ribbon plates and Measham pottery published in Waterways World and Narrowboat. We can post most items from our North Worcestershire location to any UK address at cost plus a small amount for packing. If you have any queries about any of the items on this website, please do not hesitate to ring on 01562 850458.  This website was updated on 12th April 2019.